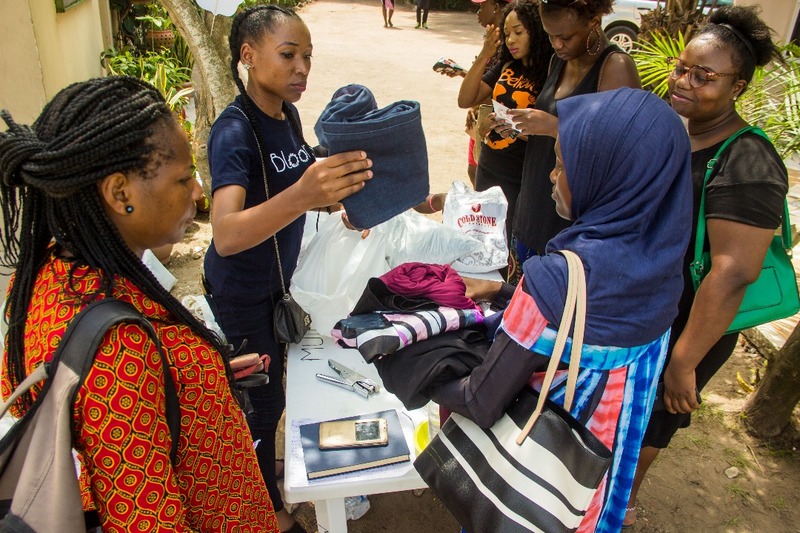 Here at Bloom Tribe, our mission is to give hope and put smiles on the faces of those around us. 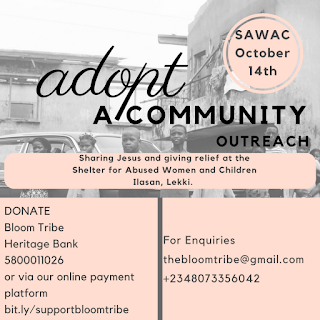 we visited the Shelter for Abused Women and Children(SAWAC) at Lekki in October 2017, we shared food, clothes, Provisions and most importantly We shared the gospel and prayed with them. It was an awesome time, The gospel preached in simplicity, oh the joy of hearing and seeing the testimony of changed lives. We are one body in Christ, Despite our difference one thing binds us together, its the love of Jesus. He gave us all so We, in turn, can give our al because He first loved us. We'll like to do this more often, reach more families and give relief. 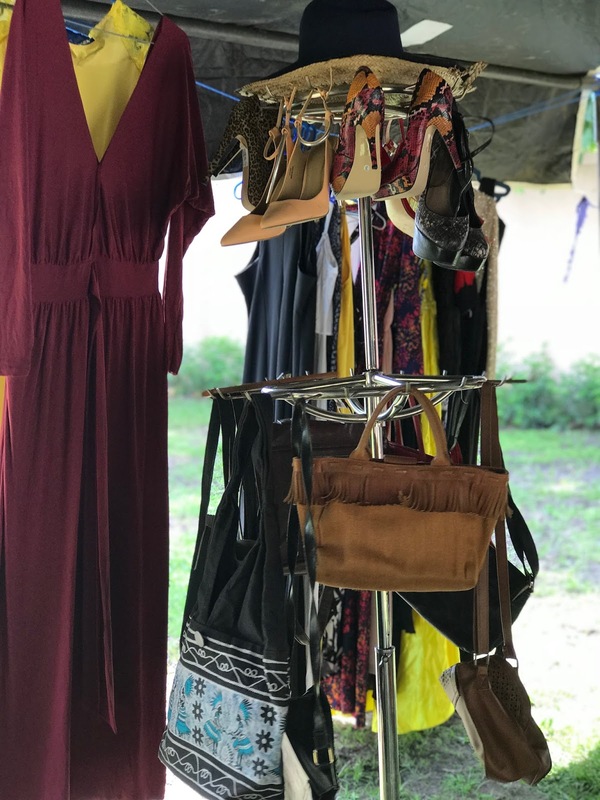 Everything1kYardsale by the Bloom Tribe. 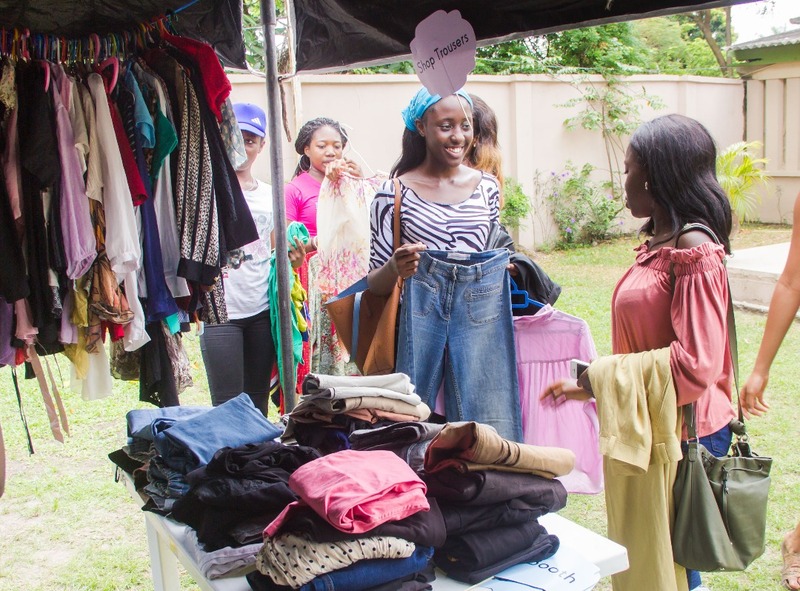 We hosted our first yard sale to raise funds for our charity projects on a beautiful Saturday at Aimas garden Ikoyi! It was a huge success thank God! 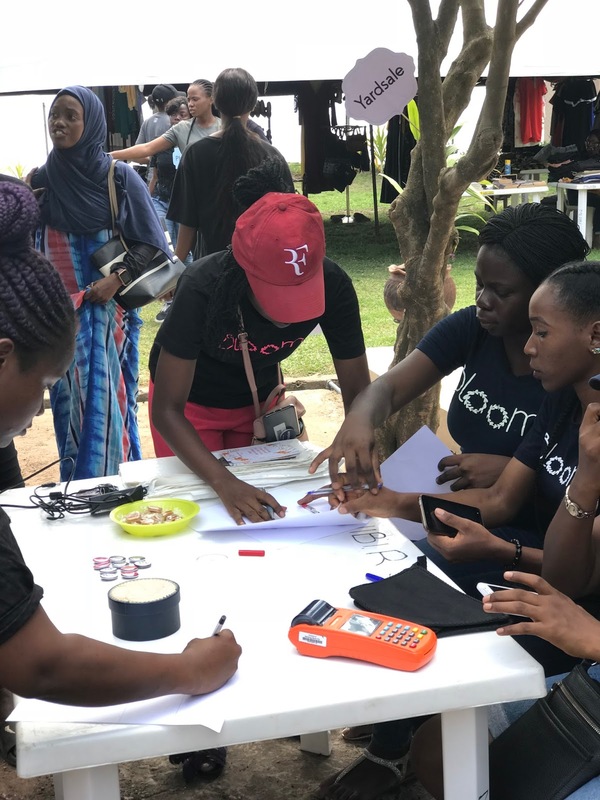 We had people come as early as two hours before the scheduled time for the event.They were ready to purchase. 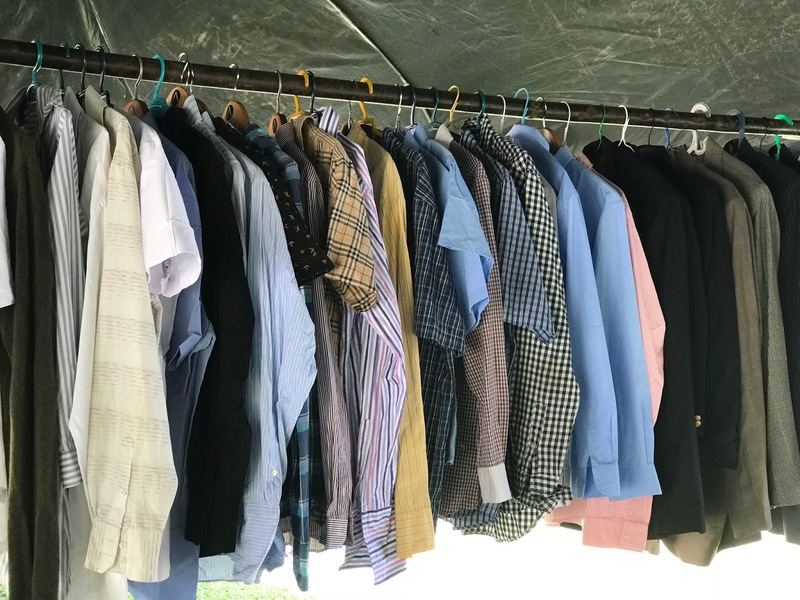 We got donations of neatly used preloved items from our friends, families, and colleagues. There were side attractions like games, food and drinks, music and a mini-auction thanks to our amazing sponsors! Thanks to our partners for making this happen and also to all our amazing volunteers who made it all happen! 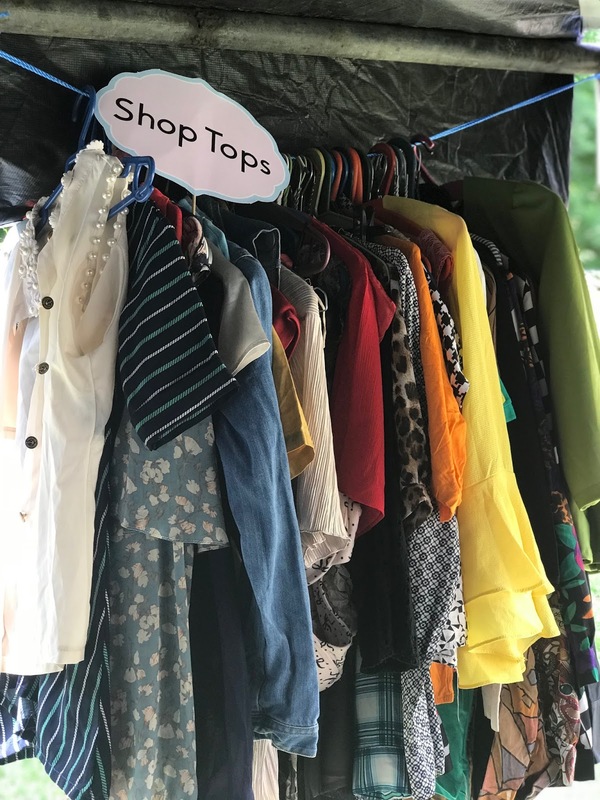 We got amazing feedback from the event so as a follow up to the Everything1k yard sale and especially for people outside Lagos who couldn't attend we will be opening up a permanent online thrift shop on Instagram @Everything1ksale. Do well to follow to know when we upload new items all for N1000. 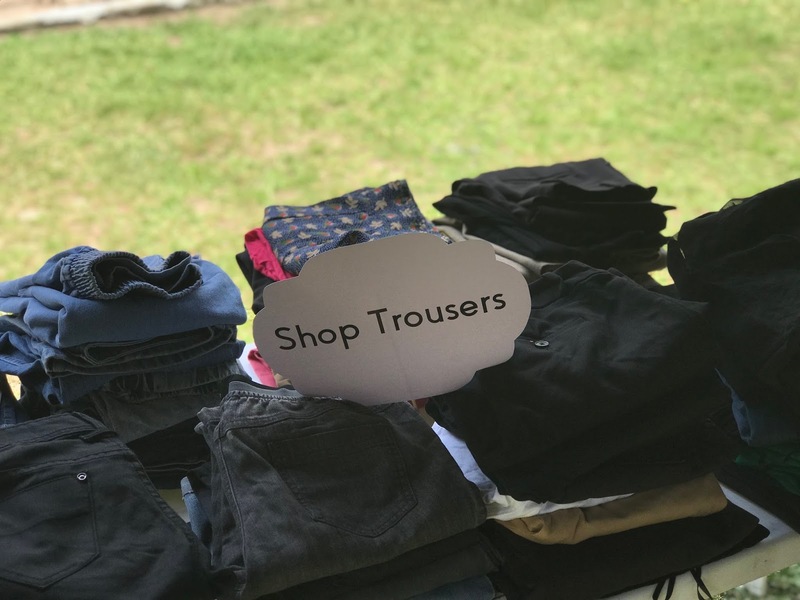 You can also partner with us by donating items that would be sold on the online shop. It's about touching lives with the gospel, through our acts of love. 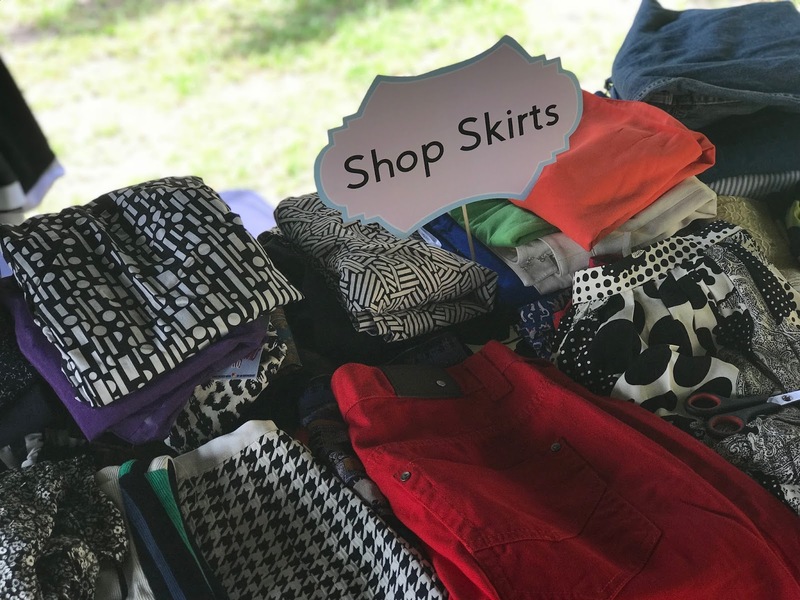 Your donations and the proceeds will go towards transforming lives in beautiful ways! 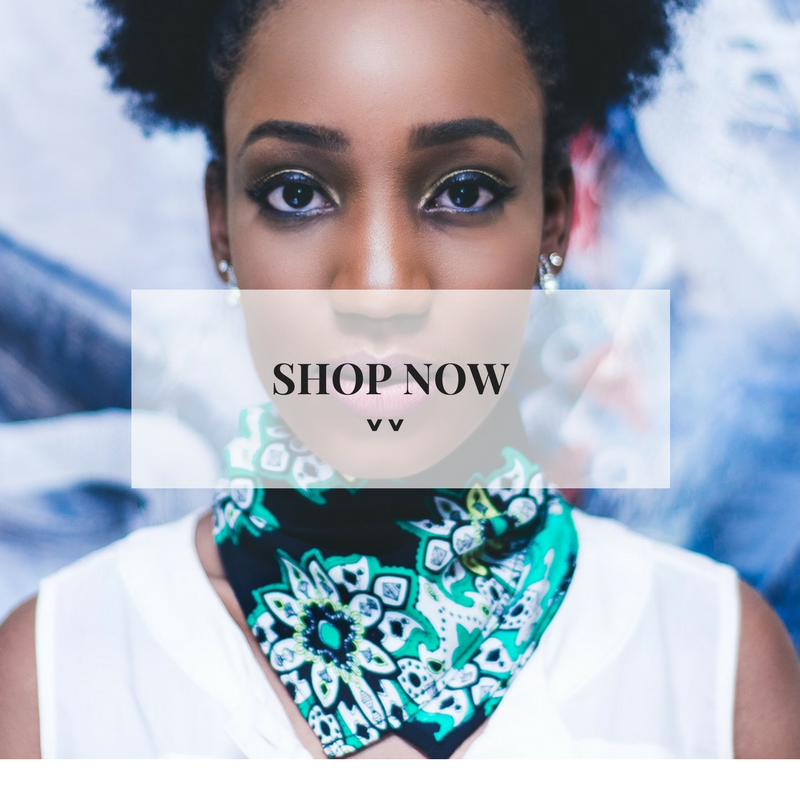 Send an email to thebloomtribe@gmail.com or Call Chidinma on 08169504390 for more enquiries. Do you know who loves you most? I’m sure you are probably thinking of your family members, spouse or children or even your loved ones right now, right? Don’t start frowning now. Let me tell you why? Because they can let you down. I bet you knew that right? Or did you? Yes even if they haven’t right now, there’s a possibility that they can, so why rely or expect so much from people that don’t have the power to love you the most? I’m going to point you in the direction of the one loves you the most! And will never let you down. HE LOVES YOU! And no you don’t owe him for loving you. He just loves you. Why does God love you so much? -Ephesian 1 v 5 : Long before he laid down the earth’s foundation, he had us in mind, had settled on us as the focus of his love, to be made whole by his love. -John 4 v 8-10 : God is love. His nature is love and he pours out his love on us even when we don’t deserve it. When he created you, he said this is good. You are good! God doesn't just love you, He likes you! Sometimes, you mess up and you have to beg human beings to forgive you but do you know you don’t have to always beg God to forgive you? He already forgave you a long time ago. When his son died on the cross for you, he took away ALL your sins. The one you committed yesterday, the one you’re committing now and even the sin you’ll commit tomorrow. When someone loves you this much, how do you respond? With even more love right? Romans 5v8 - Even when we were still sinners, God loved us. If you do something really terrible to your parent or spouse or even anyone you love, you’ll expect them to be angry with you right? What if immediately after you annoy them, they buy you a gift you have always wanted without you asking? You’ll be surprised right? Why? Because you did not deserve it. So how will you react to this? That’s exactly what God did for us ! So when you think that you are a sinner and God can never love you, remember that God never stopped loving you and that is why he sent Jesus to die (Luke 23:34). Jesus did not die to change God’s mind about you, he died to change your mind about God. NOTHING you ever do will make God hate you. -He is definitely not happy when you sin, but instead of saying “get out of my presence” he is saying “come, I love you, I don’t want you to sin again so I’ll show you how with my spirit . I love you. The one that loves you most is calling, how are you going to respond? 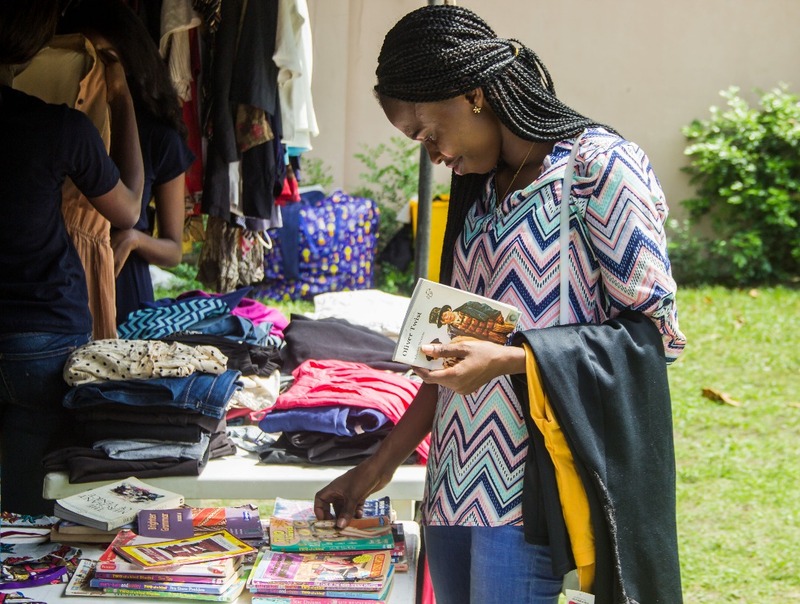 Most children from less privileged communities, especially those in orphanages, typically receive hand-me-downs. Very rarely do they know the joys of wearing brand new never-been-worn-before clothes. 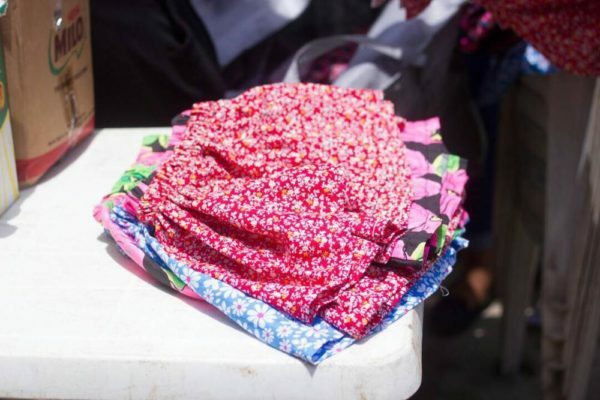 Every child deserves to have clothes specially made or bought for them to remind them that they matter and they are worthy. 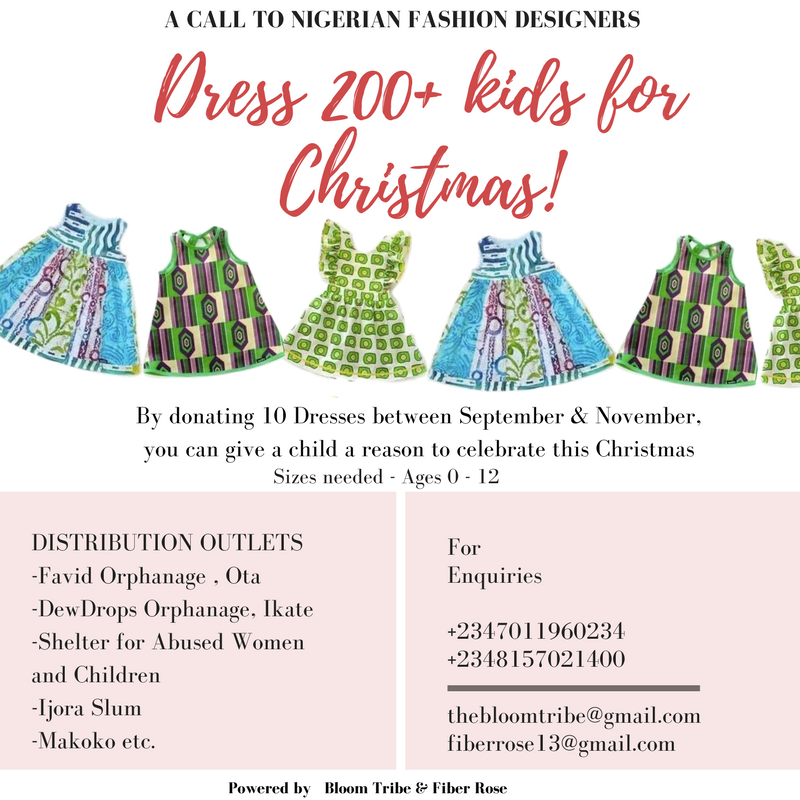 This December, we are partnering with Fiber Rose, a womenswear brand and a host of other fashion designers to Dress 200+ kids for Christmas. 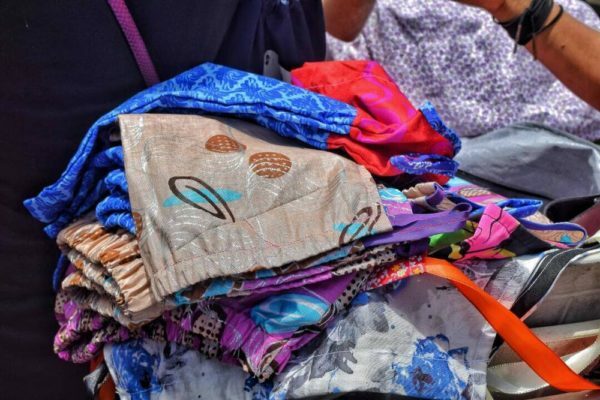 We’ll be sending these clothes to less privileged communities and orphanage homes. 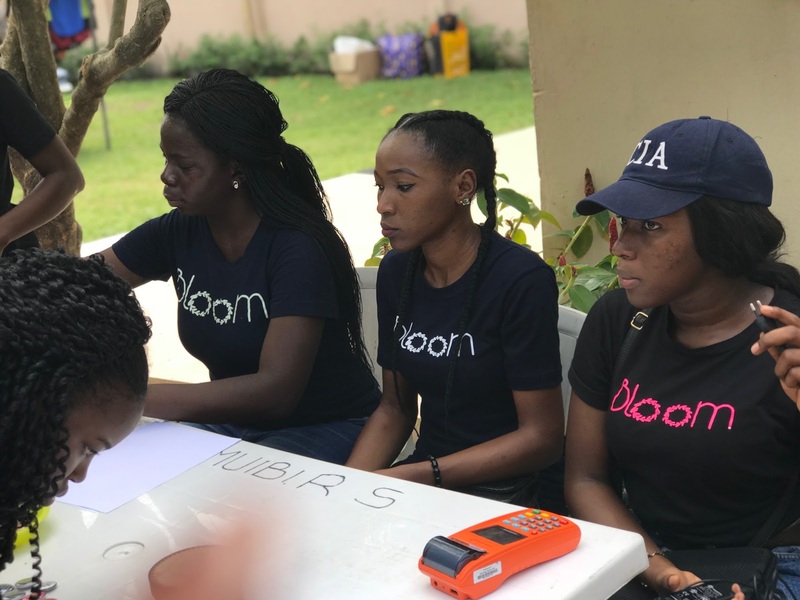 The Bloom Tribe is a faith based social enterprise serving, supporting and giving relief to less privileged girls and families in Nigeria. We exist to loose chains of injustice, set the oppressed free, share our food with the hungry, provide shelter, clothe the naked and take care of families. We envision a community of people that will take up compassion and live out simple acts of God’s love. If you are a fashion designer or you know any fashion designer that will like to partner on this Christmas Project, Kindly refer them to this post! 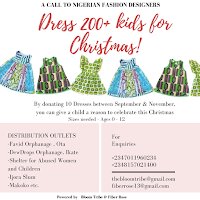 Let’s make Christmas special for as many kids as possible! 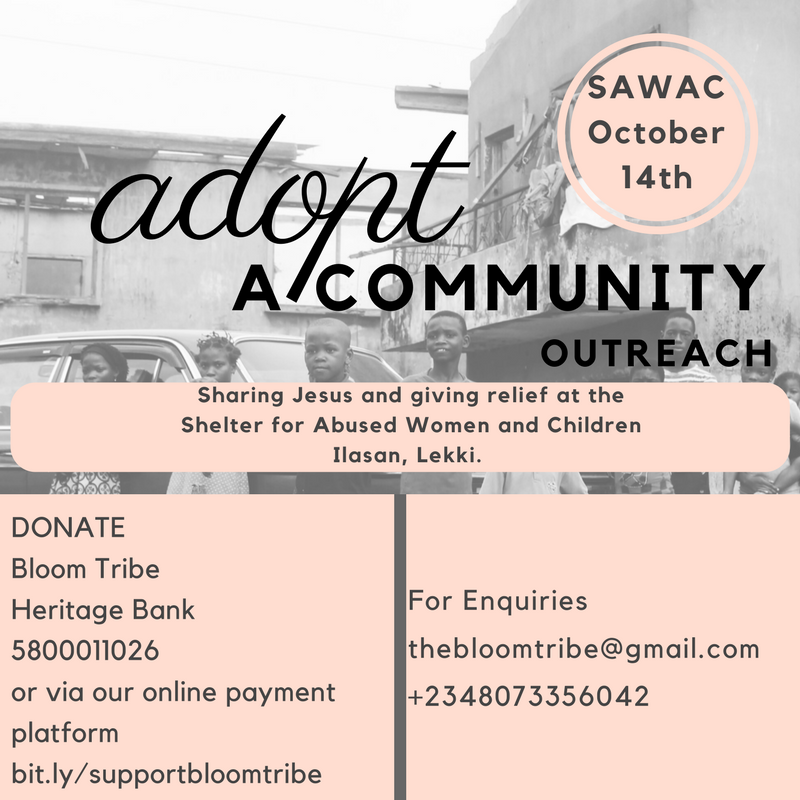 As part of our community outreach program, we'll be visiting The Shelter for abused women and children (www.sawac.org) to share Jesus and give relief! View photos of past outreaches HERE and HERE ! Here at the Bloom Tribe, our mission is to give hope and put smiles on the face of everyone around us! 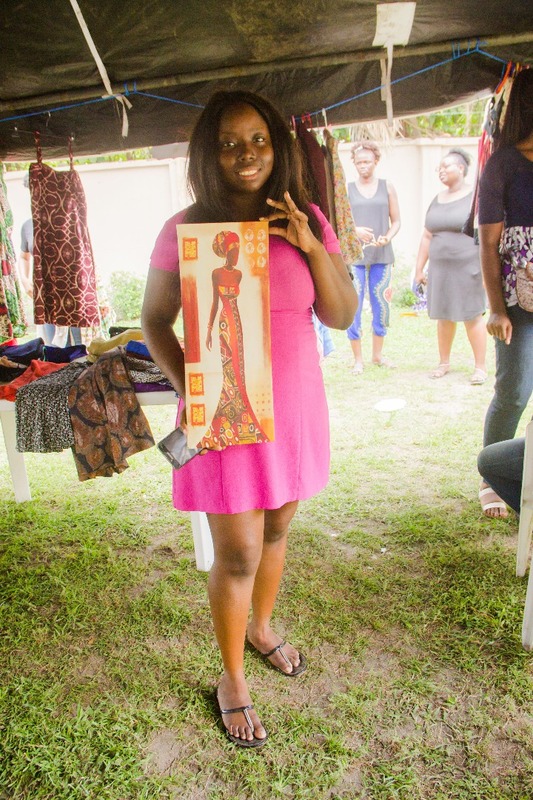 We had an awesome time at Ikate, a less privileged community in Surulere over the Easter period in April! We shared food, provisions and hygiene packs to over 200 children and widows in the community and most importantly we shared Jesus with them! It was a beautiful experience for everyone including our volunteers! Photo Credits: Rejoice Ewodage// Yetunde Arowolo. The Bloom Tribe ADOPT A COMMUNITY OUTREACH kicks off this Easter on April 15, 2017! For the better part of 2017, we'll be adopting Ikate community in Surulere. Reaching out to families and continuing with them for their progress both materially and Spiritually. 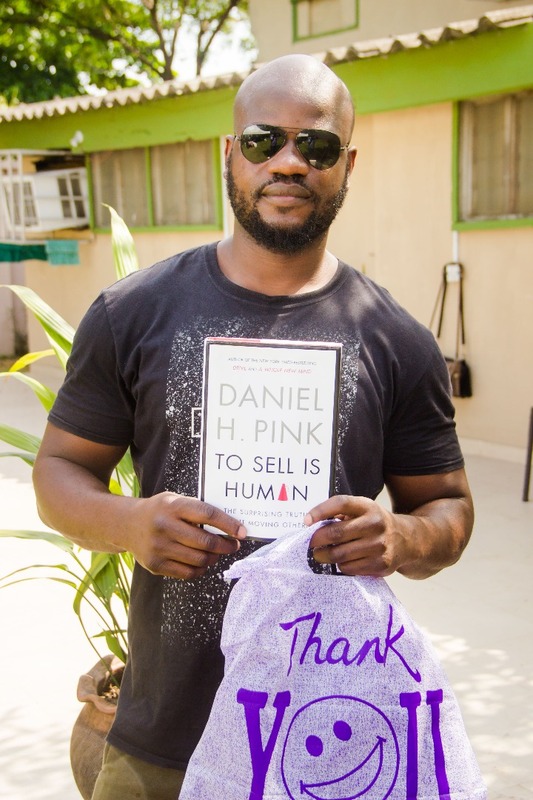 In December, we initially planned to visit an orphanage in the area but on getting there, I realized it was an entire community that needed to be reached out to; not just spiritually but materially as well and that birthed the vision for the "Adopt A Community Outreach." It's not enough for us to preach the gospel to them, we also need to join hands to cater to their material needs. Our goal is to get to know members of these communities, relate with them and continue with these families for a few more months and see them progress both materially and most especially spiritually. 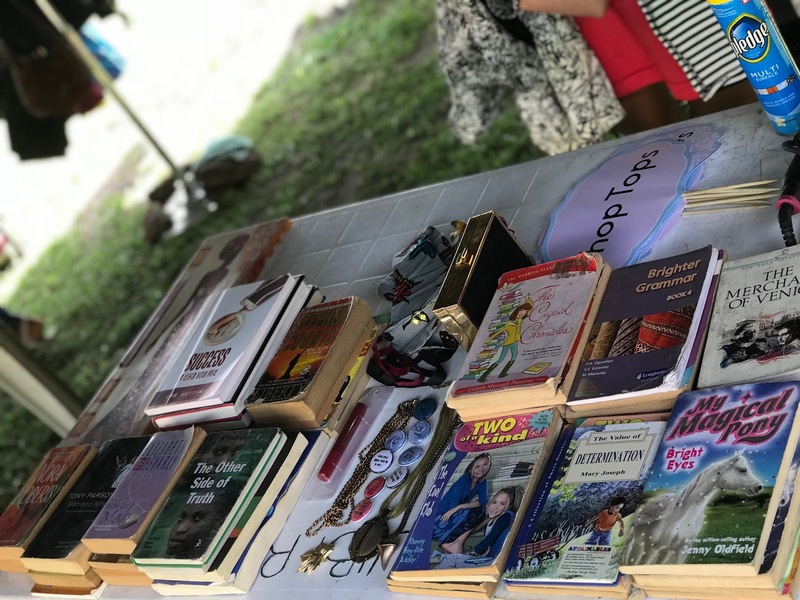 In each community, we hope to be able to take on projects like sponsoring a child to school, give a young adult meaningful employment, pay maternity bills etc. 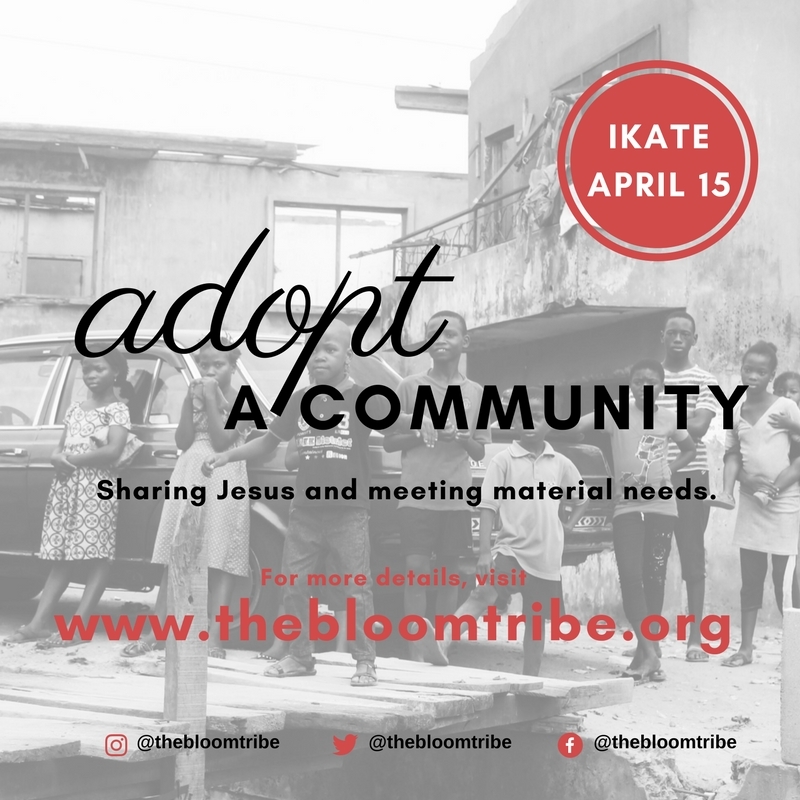 The first leg to adopting Ikate is the Easter Love Outreach on April 15, 2017. 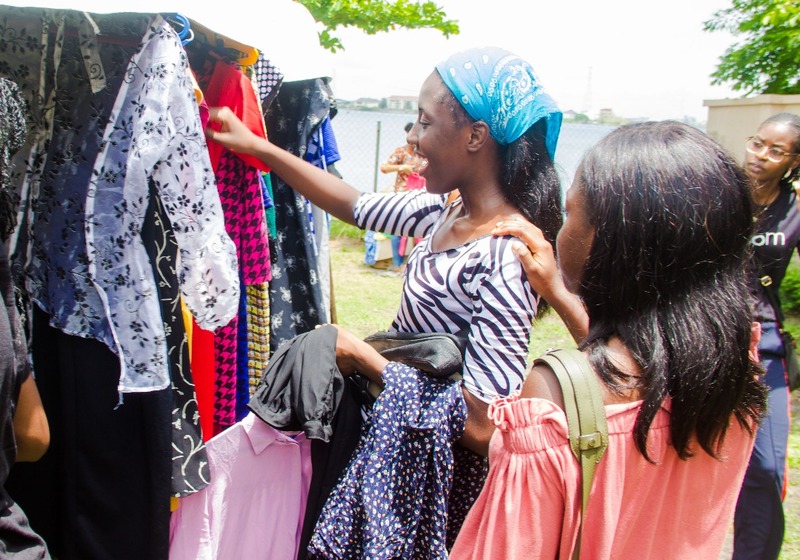 We'll be visiting Ikate with supplies and going into homes to meet families and tell them about Jesus, do something nice for them, get to know their specific needs and make plans to cater to them within our means. Location: 28 Owoseni Street, Ikate Surulere Lagos. 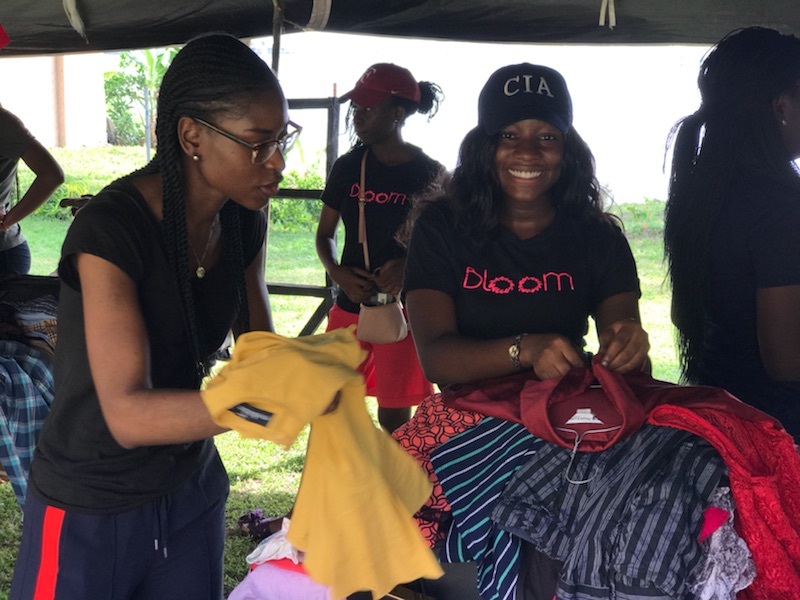 -If you'll like to donate gifts, food stuff, clothes, toiletries, money etc kindly send us an email to: thebloomtribe:gmail.com //kunmi@thebloomtribe.org. or call 08157021400. We'll be very grateful for your generous giving! 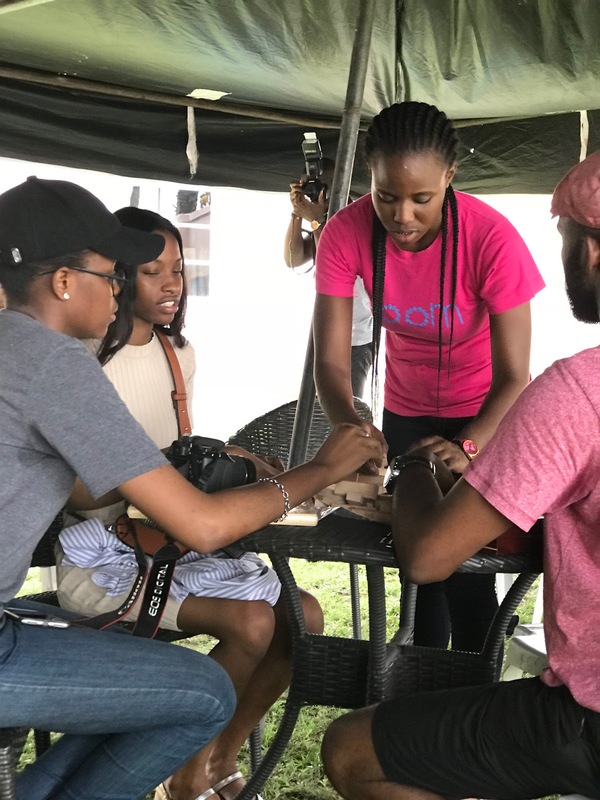 -If you'll like to come along on any of our outreaches, follow us on instagram @thebloomtribe to keep up with our plans as we progress.